Broken Arrow Magazine's August 2004 (#95) issue came out a few days ago and it's another fine issue. 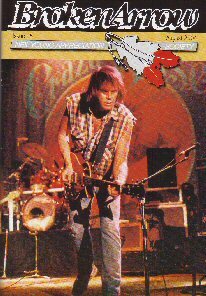 As usual, the Neil Young Appreciation Society magazine has lots of innaresting articles. Road reports on the CSN tour, touring around Neil's old town of Toronto with lots of photos by Rustie Sharry Wilson, a look back on Rick James, the Mynah Birds & Neil, and an analysis of "Cortez the Killer" lyrics (which I need to take a closer look at and do some comparing to a 1995 analysis of Cortez). A great cover shot from 1987's Garage Tour in Cologne by Dieter Ostrowski. More on N. Y. A. S. and another fine job by the BA editor. Who's daughter, incidentally, just was married this summer. Congratulations Scott!! !